With the new year quickly approaching it is time to create a vision board. This year I will be making a personal vision board and a profession vision board. 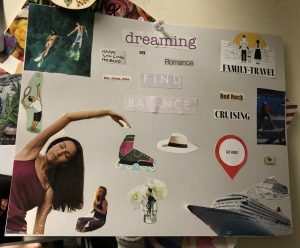 What is a vision board you may ask? Have you been living under a rock? Think of a visual New Years resolution. Gather your girlfriends, some cocktails and a lot of magazines, scissors and glue. Pull out any picture or word that grabs your attention. When you have 20 pages pulled out start cutting them out and arranging them on a 8×11 cardstock. Remove those images and words that don’t really speak to you. Then glue them down. I recommend hanging it in an area you see daily. Mine is in my closet next to my mirror, I don’t notice it everyday but it is a great reminder of where I want my mind and life to be focused. This year my personal vision board will focus on staying calm, family beauty and being more mindful. My professional vision board will focus on less screen time, staying calm, changing others health and wellness and bringing the best studio to Bakersfield!